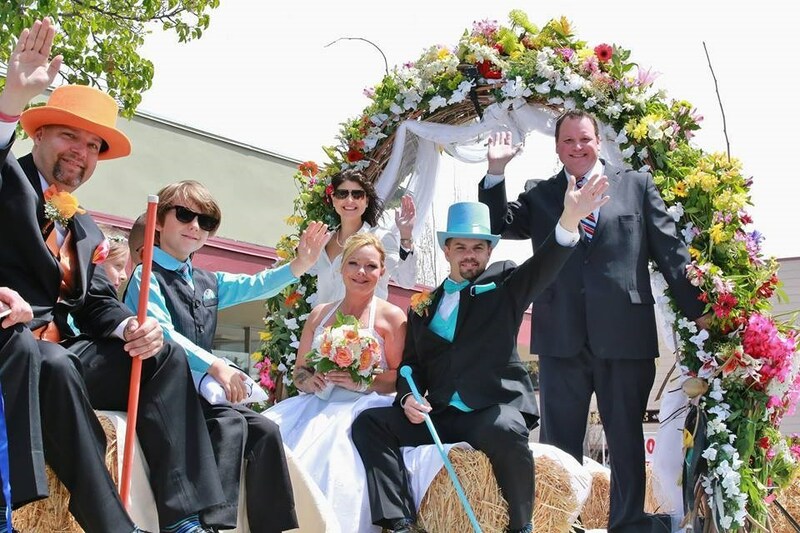 On April 28th 6 years ago, we met at the Butter and Eggs Days Parade in Petaluma, CA. Two years later, I decided to propose to Megan at the very same parade we met. My friend Mike Harris was running for Mayor and invited us to ride with him on the back of his classic convertible. Little did Megan know, friends and family were waiting at the end of the parade route with big signs saying, "Will you marry me?". 20,000 people watched as I proposed to Megan in downtown Petaluma, CA. Now where to have the wedding... How about in the parade!! The very next year, with lots of support from friends, family and the local radio station, KZST, we were married on a float in the same parade. Today we celebrate being married 3 years and couldn't have found each other without Plenty of Fish. Thank you!